Eleven-year-old Fish Rawlings has always wanted to be a cowboy. Now, in the spring of 1868, he has his chance. 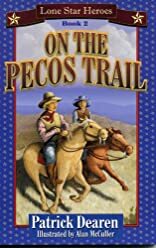 His uncle is driving a cattle herd across Texas, and Fish is going with him as far as Horsehead Crossing on the Pecos River. Little does Fish know that he is saddling up for the wildest rides of his life. With his cousin Gid, Fish is about to face mean broncs, angry longhorns, and a dozen cowboys ready to play pranks. The days ahead will be filled with sandstorms and stampedes, lightning and twisters. It's the roughest stretch of cattle trail in Texas, and it will either make a cowhand out of a boy or break him.